Brothers Cliff and Ed Thomas, along with their partner Bob McCree, had their own studio, Grits ‘N’ Gravy, in Jackson, MS in the 60s. Although a lot of their recordings were for that odious individual Huey Meaux the trio made some very fine music, notably on Peggy Scott & Jo Jo Benson and Barbara Lynn of course, but there were many other acts that benefitted from their expertise, including the incomparable Tommy Tate. 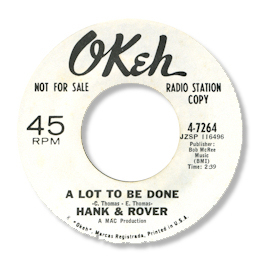 They leased out their independent productions all over the country and their tracks on the obscure Hank & Rover ended up on Chicago’s Okeh label. The uptempo “A Rock Down In My Shoe” swings along nicely, aided by some Joe Tex styled vocal touches, but the other side is the one I love. A Lot To Be Done is a classic southern soul ballad with a very serious message. The voices of the two guys are really spot on – especially the falsetto phrases – and the arrangement's just about perfect.